+ 7 = 16 Required Please enter the correct value. With every fresh report, an Apple Car becomes a more realistic possibility. The latest update on Apple Inc.'s (Nasdaq: AAPL) automotive aspirations came from The Wall Street Journal on Monday. According to the Journal, Apple is ramping up its efforts to build an electric car, planning on a 2019 ship date. Apple certainly has the resources to design, build, and sell an electric car that would have much of the world salivating. But the question for investors is whether an Apple Car would help or hurt Apple stock. On the one hand, AAPL needs to plan ahead for the day when the iPhone will no longer drive profit and revenue growth. The iPhone accounts for two-thirds of Apple's revenue. Entering the automotive industry would give Apple exposure to an entirely new, $1.6 trillion market. "For Apple, the car market is more than big enough to 'move the needle' significantly, even as the world's largest company," wrote activist investor Carl Icahn in an open letter to Apple CEO Tim Cook in May. An Apple Car would also bolster the Apple ecosystem by integrating with the iPhone and Apple's cloud services. This will work even better with a self-driving Apple Car, which the Journal says is among the company's long-term goals. 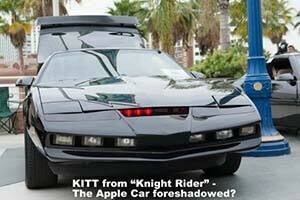 Imagine using Siri on your Apple Watch or iPhone to call out to your miles-distant car to "come and get me" just like David Hasselhoff used to do with KITT on the 1980s "Knight Rider" TV show. The potential of an Apple Car is enough to make your head spin. Car manufacturing is like nothing else Apple has done before. It will need to either construct a fancy new factory or partner with an existing automaker to build the cars. Apple will need to set up a complex supply chain that will dwarf what Tim Cook devised for Apple's other products. It will need to comply with a host of federal regulations that govern the automotive industry. And Apple has both the financial resources and corporate will to make all that happen. The one giant question looming over this endeavor is whether Apple can solve those issues while maintaining its customarily generous profit margins. Big automakers like General Motors Inc. (NYSE: GM) and Ford Motor Co. (NYSE: F) typically have gross profit margins in the low single digits, 2% to 5%. Even a luxury car maker like Porsche only has margins of about 20%. Apple's gross margins are just under 40%. That's one reason former GM Vice Chairman Bob Lutz is an Apple Car skeptic. "If I were a shareholder, I'd be very upset because they are currently engaged in a very high-margin business. The automobile business is at best a very low margin business," Lutz said on the CNBC program "Closing Bell" on Monday. "You can't show me one company to date that has made a nickel on electric cars." Given Apple's lack of experience in the automotive industry, Lutz said it would fare no better and that the Apple Car project would become "a giant money pit." Electric carmaker Tesla Inc. (Nasdaq: TSLA), the closest equivalent to what Apple is attempting, proves his point. Tesla turned its first profit in Q1 of 2013 – nearly 10 years after the company was founded and seven years after it started selling cars. But for the most part, Tesla loses money. CEO Elon Musk said in January that TSLA won't be profitable by normal accounting standards until 2020. Can Apple change the equation? It's always been dangerous to underestimate Apple when it enters a new market. Just ask Blackberry Ltd. (Nasdaq: BBRY) and Nokia Corp. (NYSE: NOK). Mobile phone industry executives back in 2007 made comments much like Lutz did Monday. One has to think that Apple has a strategy for building a car that will yield an acceptably high profit margin. Just because no one else has figured it out doesn't mean it can't be done. For example, Apple could design a state-of-the-art factory heavy on robotics that would drastically reduce labor costs. Or come up with a cheaper battery technology. Then again, there's still the possibility that Apple has no intention of mass producing automobiles. The Apple Car could and up as a technology the company will license to other automakers. That's apparently the route that Google Inc. (Nasdaq: GOOGL, GOOG) is taking with its self-driving car tech. Last week, European Google executive Philipp Justus said the company "does not intend to become a car manufacturer." Of course, there's always the worst-case scenario – that success has gone to Apple's head and it's making an ambitious but ill-considered jump into a market it doesn't understand. It's possible that a strong desire to disrupt the auto industry is clouding the judgment of Apple's top executives. And several of them, particularly design guru Jonathan Ive and Senior Vice President of Internet Software and Services Eddy Cue are avid car collectors. Cue once sat on Ferrari's board of directors. Luckily, Apple has enough cash and income from the iPhone that even a miscalculation on the Apple Car won't sting too badly. But it would leave the company with one less path to future growth, and that, in the long term, could ding AAPL stock. The Bottom Line: Enough has leaked out that we know that an Apple Car of some kind is in the works. And while an Apple Car no doubt would have a "wow" factor, whether it makes sense for Apple is very much an open question. Unless Apple has a very smart strategy up its sleeve, the Apple Car project carries a lot of risk – something AAPL shareholders certainly don't want.